As per Forum rules, you MUST put up a selling price. Noted and added a selling price. 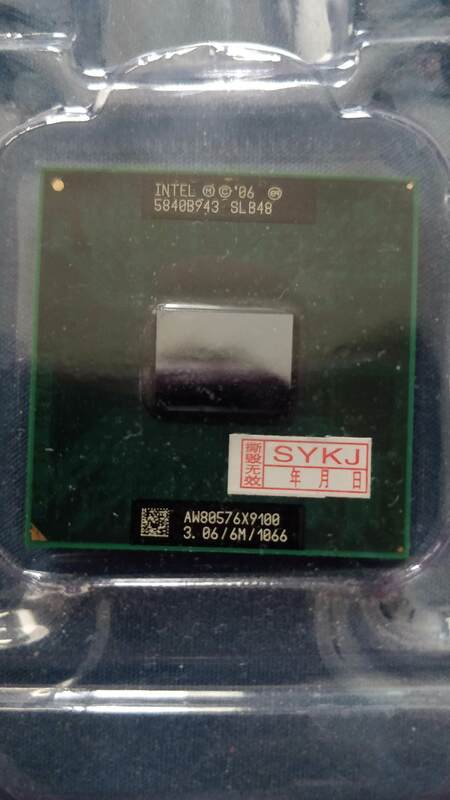 This is a rare 6M Cache, 3.06 GHz, 1066 MHz FSB processor suitable to use on Thinkpad T400 or W500. Selling for USD$50, including shipping, as upgrading to a X230. Topic: Getting Thinkpad Dock 2503? Topic: T43p: Which HDD-SSD process should I follow? Re: T43p: Which HDD-SSD process should I follow? i just changed my os to lubuntu and playing youtube, watching 1080p video are quite smooth compared to my previous win7. this is all done on my 80gb ide hdd, still thinking of getting a msata ssd with a msata to ide adapter. Topic: T43 AC Adaptor Dead? Re: T43 AC Adaptor Dead? I'm not in the states and already got an adapter. Thanks for your offer. Haha I know, already looking for one. Just interested to know if anyone here have done it before. I think the spare ac cable somehow killed the adapter coz after I switched my main adapter to the spare ac cable, it does not work anymore and this is probably the case for my spare adapter as well. Now I'll have to do this. Anyone try it before? OMG now my main ac adapter is also dead! I tried to switch the ac cable between the main and spare ac adapter with the ac cable plug still connected to the electrical extension. Does this cause the adapters to die? I'm using this ake expresscard 54mm 2 x esata card on my t43 and it works great! Plug and play on Win7, maybe going to try out Win8 and hope it'll work. The only minor issue I've is the connectors does not provide any locking thus the esata cables can be easily removed thus disconnecting the hdd. No hdmi output, usb3.0 ports, expresscard 54 slot... will give it a miss. 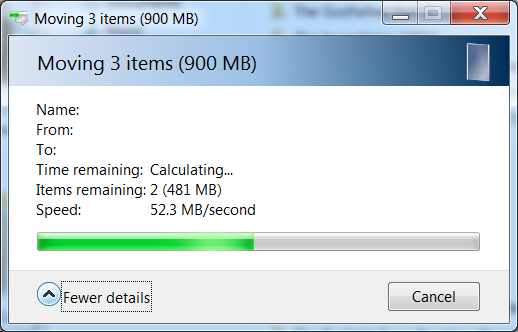 This is my transfer speed on my t43 using a esata express card over a gigabit lan. My bluetooth headphone is able to pair successfully using Toshiba bluetooth stack on my PC running Win7 but not on T43 running Win7 using IBM bluetooth stack. Is it possible to install the Toshiba stack on my T43? I'm using Win7 after finding out WinXP does not support more than 2TB HDD capacity. It's work great, with all the hardware drivers! Maybe when I've time will try out Win 8.1. Managed to found a workaround for this! My T43 connected to my 32" LCD TV via VGA port running XBMC is able to play all 720p videos smoothly (lag on 1080p)! Now my T43 is a NAS + media player! Next step is find a remote control! Are there any modded bios that can fix this problem where someone else had resolved this issue using another notebook found here. I've 2 x 3.5" 2TB hdd lying around and I want to connect it to my T43 using this and this and run it 24x7 as network file server. Anyone have any idea will it work? Juz installed Win7 on my T43 and Windows Update installed the audio driver nicely. Problem is I hear no sound playing using the built-in speakers but there's sound when I connect my earphone to the audio jack. I've been using a IBM T43 for years, recently started to carry around thus looking at the lighter and more powerful notebook. or a brand new ASUS Eee PC 1215B? Harryc wrote: Try one memory module at a time. Try both slots with each module. Tried that, one slot at a time and at different slot. Also tried different memory. Harryc wrote: Remove all memory. Does the laptop beep? Yup it's beep. Also pretty sure the memory are working.